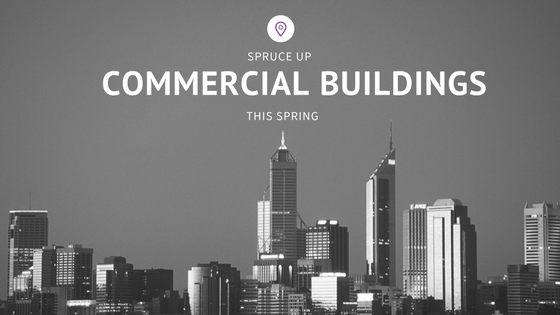 Spruce Up Your Commercial Building [Spring 2018]. As the dark nights give way to lighter evenings and the colder damp weather subsides it is an ideal opportunity to inspect your commercial building. Maintenance now can save on costly repair bills in future if you own the building. If you rent can save on end of lease dilapidation costs. Here are the main reasons to spruce up your commercial building this spring. What are Areas Of a Commercial Building prone to Wear & Damage? As the area of a building that takes the brunt of the British weather, metal roof sheets can quickly break down and corrode. Annual or bi-annual surveys are recommended to look at the condition of edge laps. If there are signs of cut edge corrosion, it is recommended to repair these with a suitable system as soon as possible. Roof sheets can also be affected by bird and pest droppings. As with metal roof sheets, the side elevations are prone to constant wet, cold and then UV damage. Fading paintwork is the first sign that the existing coating is beginning to fail. Complete failure should be avoided as the panels become too weathered to re-coat. Some elevations may be more prone to failure than others due to their position. Regular maintenance of the building with the cleaning of regular cycles can prevent the build-up of harmful contaminants and prolong life expectancy. Industrial type roller shutter doors are constantly used and are prone to damage and weathering. Dirt can often accumulate in the joints and minor damage can be caused by forklifts and heavy good vehicles. Again regular maintenance cycles can prevent early break down of the coating. Office windows and shop front windows can be affected by external factors like the weather. Faded windows can affect the overall aesthetic of the building. The difference recoating can have on windows can be dramatic especially if changing colour. High street stores, supermarkets and car dealerships constantly change colours to attract more footfall to their premises. A new fresh look is more inviting. High traffic areas such as entrance and lift door can be more susceptible to wear and tear as the people who use the doors inadvertently cause damage over time. Carrying keys, jewellery, umbrellas and other items impact the door each time it is used. Over time this can impact on the durability of the coating. As with other external elements, these can quickly deteriorate if not maintained and rust can appear. Regular maintenance cycle of cleaning and re-coating can prevent corrosive damage and improve overall appearance. Ceiling soffits and suspended ceilings can brighten up office environments and sales floor space when re-coated. The coating colour maybe dated. Colours tend to go through trends. For example, some office buildings went for a green colour scheme in the nineties, others brown and some blue. When changed to the latest trend of grey it can completely upgrade the appearance of the building. Depending on the location of the building, other environmental factors may accelerate the failure of the coating applied. Commercial buildings close to coastal regions, rivers and town centres are, particularly at risk. Whatever stage of the maintenance cycle your building is at, we can offer advice and coatings system to prevent further damage or simply change colour. Contact us for further information.